UNITED NATIONS, May 18 -- About Darfur, the UN says many things. But which of them are true? "Ban, in an interview with Reuters television on Wednesday, said, 'We have a firm agreement in principle between the Sudanese government and United Nations and African Union that there will be a hybrid operation, so therefore it is a matter of implementing this commitment. It is very important for Sudanese government to keep their commitment,' he said, after having conducted a series of telephone calls with Sudan's President Omar Hassan al-Bashir." But Al Rayyam newspaper in Khartoum on May 18 quoted a Sudanese official who "denied any contact with the UN Secretary General on the AU-UN hybrid operation in Darfur" and who said that "the last phone call between Ban and the Sudanese President Omar al-Bashir was 'three weeks ago.'" Which is it? The Al Rayyam report was picked up the same day by the Sudan Tribune, which is an English-language publication which is included in the Ban's spokesperson's "morning headlines. But this Sudan Tribune report, with the headline " Sudan denies discussing hybrid force with UN Secretary General," was not included, only another story not directly contradicting the Reuters piece which, whether accurate or not, made Ban look relatively strong and effective. "Aides describe Ban as persistent in pursuing agreement on the force, noting that he told the Korea Society earlier this week that Darfur put to the test 'the authority of the Security Council, the image of the United Nations in the Arab world and the credibility of the United Nations.'" The UN's credibility is not only put to the test by the presence or absence of violence in Sudan, but by statements made right at its headquarters in New York. Did Ban's office seek any correction from Al Rayyat? UN envoy Jan Eliasson, presented to the select(ed) press Friday by Ban's Spokesperson, said that Sudanese "civil society" must be engaged. So one would think the UN would repudiate false reports in the Sudanese press, if they were false. Or perhaps Reuters mistakenly tied Ban's boasts on Wednesday to the "series of calls" with Bashir which Reuters only surmised. But then it would have been important for the UN to seek clarification and amendment by Reuters. Because the result is Ban's claims about conversations with Bashir being directly denied in the Sudanese press, to the Sudanese civil society than Mr. Eliasson says is so crucial is peace is to be restored, by the UN or anyone else. Jan Eliasson's UN press conference Friday was moderated by Ban's spokesperson, who chose which journalists to call on and at the end granted questions and oration-opportunities to "some hands that have been up for a long time," while pointedly ignoring hands that were raised since even before Mr. Eliasson began speaking. Video here. Nor did Ban's Spokesperson stay after Mr. Eliasson left, to answer questions, including this one about Ban's own reported and now contradicted statements. Nor were other questions allowed before Mr. Eliasson began, including mounting questions about how transparently Ban is running the UN, click here for one example. Developing. Another Darfur-related question that was not permitted concerns the statement by a "senior UN official" -- who insisted and insists on only being identified as such -- that a white Andopov-26 airplane photographed by UN experts in Darfur, presumably moving weapons, was from Kazakhstan. Inner City Press was present when the claim was made, and the dubious Kazakh connection was reported by, among others, Reuters. 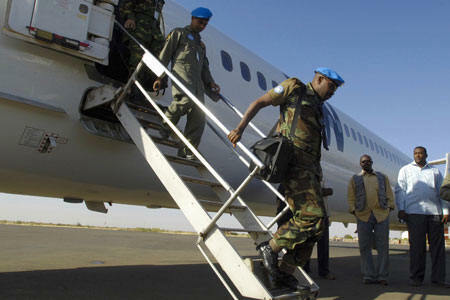 Since the UN's claim is contradicted by the most rudimentary research in publicly-available data bases of airplane sales which shows the plane being sold to Sudan by a Russian airline as Inner City Press reported that very day, one wonders if the UN in the four weeks since has ever retracted or amended its official's "background" accusation, beyond insisting that the official's anonymity be preserved. The UN, particularly Secretary General Ban Ki-moon, may not be able to control or even much influence events in Darfur. But they can and should control their own statements. Developing.